Back in April, I gave a guest lecture on Bayesian regression for the psychology department’s graduate statistics class. This is the same course where I first learned regression—and where I first started using R for statistics instead of for data cleaning. It was fun drawing on my experience in that course and tailoring the materials for the level of training. Some slides from the talk. 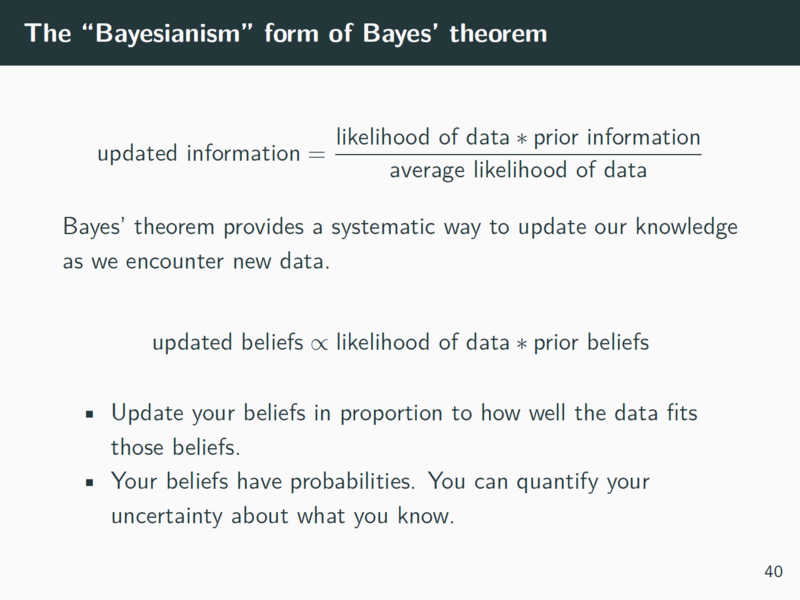 As I did with my last Bayes talk, I’m going to note some questions from the audience, so I don’t forget what kinds of questions people have when they are introduced to Bayesian statistics. One theme was frequentist baggage . One person asked about Type I and Type II error rates. I did not have a satisfactory (that is, rehearsed) answer ready for this question. I think I said something about how those terms are based on a frequentist, repeated-sampling paradigm, whereas a Bayesian approach worries about different sorts of errors. (Statistical power is still important, of course, for both approaches.) Next time, I should study up on the frequentist properties of Bayesian models, so I can field these questions better. Another bit of frequentist baggage . 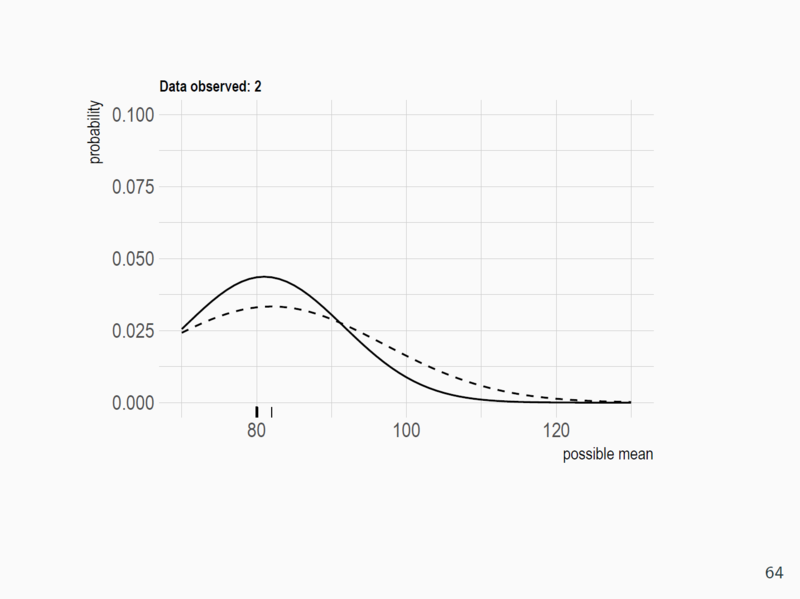 I mentioned that with a posterior predictive distribution, we can put an uncertainty interval on any statistic we can calculate, and this point brought up the question of multiple comparisons. These are a bad thing in classical statistics. But for Bayes, there is only one model, and the multiple comparisons are really only the implications of one model. Someone else said that they had heard that Bayesian models can provide evidence for a null effect—how does that work? 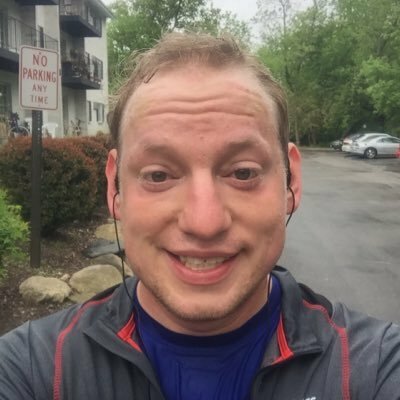 I briefly described the ROPE approach, ignoring the existence of Bayes factors entirely. For future iterations of this tutorial, I should have a worked example, maybe a blog post, on each of these issues.